To begin with a simple point – fluid (oil and gas) will only move from one place to another if something is pushing it. (Newton’s first law). For the fluid in the reservoir under the Gulf, this force pushing the oil out is the difference in pressure between the oil in the rock, and the pressure in the well. 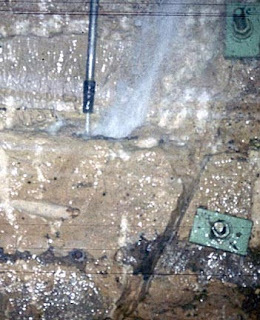 The pressure of the oil in the rock is 12,000 psi. When the well was drilled the pressure of the mud that filled the well was over 13,000 psi and no oil moved into the well. Just before the disaster the fluid in the well was changed from mud to seawater. This lowered the pressure of the fluid in the well below that of the fluid in the rock, a differential pressure now existed, and where there was a passage through which the oil and gas could flow, and they did. The question has always been – how much? Gas flows more easily through cracks than oil, and the disaster was first evident when leaking gas reached the drilling rig, and then ignited. The BOP then, at least partially, functioned. After the rig sank, the riser also sank, bending the pipe just above the BOP. At that time there were reports that a Coast Guard ROV examined the underwater assembly and did not see any obvious oil leaks. A couple of days later the flow was suggested at about 1,000 bd, and this then escalated to 5,000 bd. As cameras began to publically monitor the outlet of the riser the estimates started to grow, but a not-well-publicized effort measured the flow out of the riser, and found that it was around 8,000 bd, with allowance for leaks, the overall flow was estimated to be perhaps 12,000 bd. Once the broken part of the riser was removed and a cap placed over the well, a significant portion of the escaping oil was captured and could then be measured as it flowed into the surface vessel recovering it. Those values are currently at around 15,500 bd. BP is currently planning on additional capture this week of up to another 10,000 bd, and preparing for a worst case scenario with a flow rate of 80,000 bd. These numbers vary a lot, and yet they could all be correct. Why? Well its called erosion, and simply put, the oil and gas that are flowing out of the rock are bringing small amounts of that rock (in the form of sand) out with them. 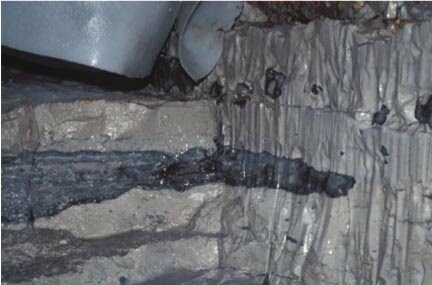 Rocks that contain lots of oil are not that strong and are easily worn away by the flow of fluid through them. Let me make an analogy with soil. 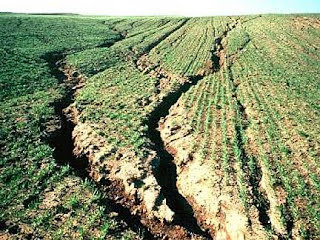 If I make a hill of soil, and leave it sit for a while there will be a number of rainstorms fall on the soil. 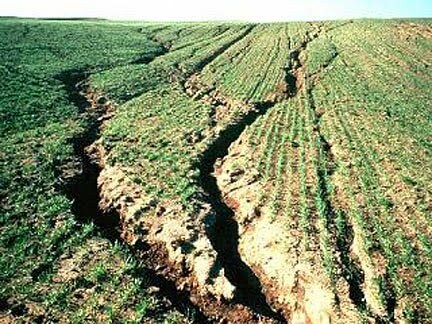 Initially the surface will all erode relatively evenly under the diffused flow after the rain, but very quickly weaker parts of the soil will be removed faster and instead of a smooth surface, the soil will be selectively eroded and channels or rills will start to form on the surface. These are larger than the passageways around the individual grains of soil, and so it is easier for the water to flow in these channels, and so more water collects in them and moves through them. As it does, because the fluid can easily get around the soil particles, and this was a weaker area already, more soil is removed, and the channels get deeper. This is known as concentrating the flow and means that, over time the channels grow bigger, the fluid flows faster, and it has a greater potential for erosion. This also happens when oil and gas start to flow from a reservoir. It is generally not a good thing to allow, since the sand is still in the oil and gas when it reaches the surface and it is expensive to get out – as well as causing the problems I am about to talk about. So to stop it the well is fitted with a screen when it is first opened. The screen holds the rock particles (sand) in place around the well, slowing if not completely stopping the creation of the channels. But sometimes the deposit doesn’t flow very well, the oil may be heavier, or other reasons, and in this case allowing those channels to develop can help production. This technique is known as CHOPS – Cold Heavy Oil Production with Sand. (The report cited is a multi-chapter pdf). 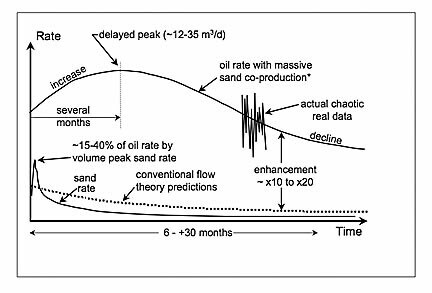 The impact of allowing the sand to flow with the oil and gas (to be produced in the terminology) is very significant. There is thus a very good reason, from the oil in the rock point of view, for the production to have been increasing the way that it has. And for it to increase to the levels that BP are taking precautions to capture. And because they cannot get access to the flow channels to restrain their growth and hold the sand until the relief wells are drilled, that increase may well be unavoidable. Now to the second part of the puzzle, which is what that sand does to the flow passages. 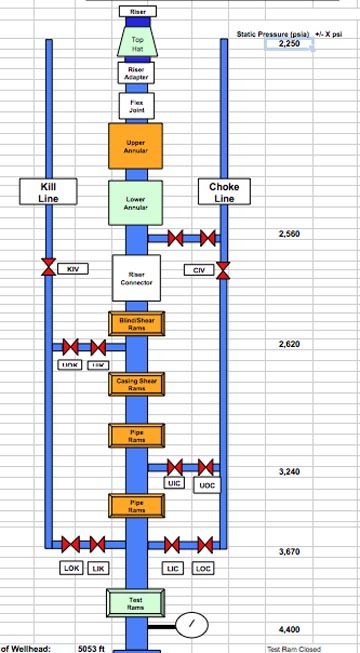 The DOE release of some of the documents from BP included pressure measurements at different points along the BOP as taken on the 25th of May. Because of the erosion, values only exist transiently, so dates become important. When I cut with an abrasive slurry system the jet flows through a nozzle that is about 1 mm in diameter (0.04 inches). With a pressure drop of 5,000 psi across the nozzle, that jet, once formed, will cut through casing steel in around 15 seconds. It will cut through ASTM – A108 steel to a depth of over an inch at a traverse speed of 1.5 inches a minute. (Cement is much easier to cut). In this way very small initial openings are very easily made wider, to allow a greater volume flow. (And for those who assert that changing material properties will stop erosion, one of my upcoming papers deals with what happens to diamond). The pressures across the BOP don’t show the pressure drops that they did earlier in this disaster. At one time it was reported that the pressure below the BOP was in the 8-9,000 psi range and that above it 2,800 psi with the 2,250 psi pressure being that of the seawater outside the riser. At that time I calculated that a flow of 500 gallons per minute (17,000 bd) would only require a gap in the range of 0.5 to 0.7 inches in effective diameter to allow that flow, at that pressure drop. The pressure below the BOP is now at 4,400 psi with a pressure drop of around 2,150 psi which will slow the erosion significantly – but not totally. For that pressure drop to have occurred, for the same flow rate, the effective equivalent diameter through the BOP need only increase by 0.1 inches to 0.8 inches, which is not a lot. 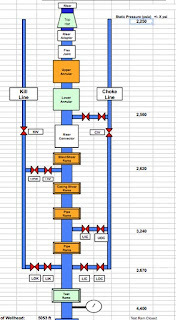 Were the effective diameter to increase by only another 0.15 inches the flow would increase to 25,000 bd, and if the effective diameter were to double to about 1.7 inches, then the flow would reach the maximum capacity that BP will be able to handle of 80,000 bd . Given the steady erosion that the BOP is seeing, and that a slow rate over time still gets there, perhaps it is not foolish of BP to bring in that additional capture and storage capacity. And since a picture sometimes helps, the following picture shows a single ASJ jet at 5,000 psi cutting the walls of the OmniMax Theater under the Gateway Arch in St Louis. We cut the full 15 ft of the new wall exposure with the system (to make the hole for the theater to be put into). The jet flow rate was around 5 gpm. And this was the cut after a single pass, we were cutting about 18 inches deep on a cut (rock and cement cut a lot easier than metal – though we accidentally ran over a couple of those bolts and cut them right off). Dolomite and chert cut with an ASJ in the walls of the Omnimax Theater under the Arch in St Louis. (Its all hidden behind the concrete wall now).